Dental education has a long history in Louisiana, dating as far back as 1861, with the establishment of the New Orleans Dental College (1861-1877), followed by the New Orleans College of Dentistry (1899-1909), and dental schools at Tulane (1909-1928) and Loyola (1914-1971). 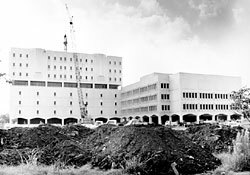 When Loyola could not afford to continue its dental program, the Louisiana Legislature authorized the building of a dental school as part of the LSU System. Over the span of four years, operations at Loyola were transferred to the new LSU School of Dentistry (LSUSD). The last class of Loyola dentists graduated in 1971. The first class of 27 LSUSD dentists graduated on June 3, 1972. Since that first graduation, over 6,000 dentists, dental hygienists, lab technicians and dental specialists have been educated here. Today, this means that 75% of the dental health care professionals in Louisiana have been trained at LSUSD. The school is located on a 22-acre tract of land near City Park that was acquired from the federal government. The 30 barracks on the site at that time were used during World War II as housing for the Navy. In order to construct a permanent physical plant for the school, a grant was obtained from the United States Department of Health, Education and Welfare. The 344,000 square foot project cost $15,500,000 to build. Of this total, $10,500,000 came from the federal government and $5,000,000 came from the State of Louisiana. It was arguably one of the best bargains the State of Louisiana ever received in a building. Formal dedication of the new school took place on Friday, February 18, 1972. The flooding that followed Hurricane Katrina caused the school to relocate to the South Campus of LSU in Baton Rouge. Tapping into 40 years of goodwill among the alumni, a network of 182 dentists, oral surgeons and dental hygienists in the community agreed to supplement the clinical training of our fourth-year students and residents. Two years after Hurricane Katrina, the students, faculty and staff returned to its main campus in New Orleans. Immediately following the return to the main campus, LSUSD welcomed a new dean, Dr. Henry Gremillion. He is a 1977 graduate of the school and became dean in October 2008. Today, students, residents and faculty provide care in 11 locations statewide with an average of 100,000 patient visits annually. Each year the school also participates in community outreach events to reach the underserved and impoverished in our state. Dental screenings, sealant placement, oral health education and direct care were among the services offered. Multiple facility projects and renovations have occurred in the years following Hurricane Katrina. On the main campus, the common areas, which include the cafeteria and campus grounds, have undergone a total transformation. Contemporary food facilities and a coffee shop, professionally landscaped grounds and a new patient parking lot have all contributed to the quality of campus life for the LSUSD community and for our patients. Classrooms and clinics have also been improved. The students’ primary wet labs have been gutted and upgraded; our advanced practice/faculty practice clinic has been enlarged to accommodate a lab; and our distance learning classroom—used primarily for dental hygiene students and continuing education—has been expanded and renovated. In addition, a new patient screening clinic equipped with surgical suites was established to streamline and improve the patient screening process. All projects were made possible through the generosity of our alumni and private contributors. A fundraising campaign is also currently underway to expand and renovate our preclinical and simulation laboratories. Off campus, a general practice residency satellite clinic was established following the closing of the LSU South Campus site in Baton Rouge; our dental clinic at University Hospital of New Orleans was renovated and expanded; and a partnership with Our Lady of the Lake (OLOL) Hospital in Baton Rouge was established following the closing of Earl K. Long Hospital. Both our oral and maxillofacial surgery and general practice residents rotate through OLOL. On March 17, 2015, the Federal Emergency Management Agency (FEMA) announced that it had approved a $58.4million grant to LSUSD for mitigation of damage caused by Hurricane Katrina. The elevated building will include clinical and basic science research areas, a state-of-the-art faculty practice, and the mechanical and electrical equipment that will operate the three buildings. All three of these components were previously housed on the first floors and basement of the existing buildings. Following Katrina, FEMA prohibited using these areas for any critical operations to avoid loss from future catastrophic flooding. In 2015, the LSUHSC Foundation also contributed $500,000 to establish a new Interprofessional Education (IPE) Health Clinic on the dental school campus. The initiative offers students the opportunity to engage in interactive learning with other health professionals to build an improved patient-centered health care system. Once students understand how to work as members of a collaborative practice team, they are better equipped to improve our fragmented health care systems and address the access to care needsof the population. The endeavor will be in cooperation with the LSUHSC School of Nursing and will serve as a much-needed resource for citizens who live and work in the New Orleans Mid-City Area.